We have a mailing list of people searching for the various Slumber Babies. I’m looking for a 1989 Fisher Price Slumber Babies rabbit doll in an aqua print pink outfit with aqua bunny ears, and aqua binding on the hood and feet. 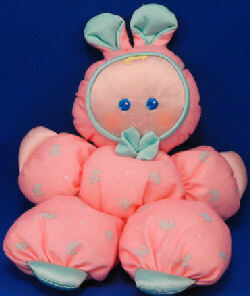 I am trying to find and purchase a pink rabbit Slumber Baby for my daughter, who is now 21 and in the military. She had 2 of these as a child, and I would love to warm her heart with another one. She is unaware that I am trying to locate a Slumber Baby for her. As a family we have had some very trying times the last 12 months or so, and it is very difficult for my daughter being so far away from home. She feels very disconnected. I’m hoping the Slumber Baby will comfort her somehow. We actually still have a very tiny piece of one of the Slumber Babies. It is gray with age and hundreds of washings. This website has a yellow one. And this website shows a pink one, Item number #1363/5776, but the page it’s on hasn’t been updated since 2006, but who knows. Thanks, Barb. I’ve written Alivia’s Toys to see if they are still open and if they have it, and I sent the links to the mailing list. Thanks, ToyFinder! I passed your information along to the mailing list. Thanks, Melanie! I sent it to the list.